This page features a set brand new blue tint anti-glare CURVED wide rear view mirror in 300mm, easy clip on with ultra thin design to enhance visibility and safety. 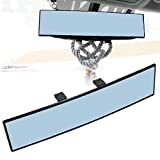 This curve wide rearview mirror has blue anti-glare tint on the surface to eliminates blind spots, increases visibility, and enhances safety while driving. This 300mm Curved Wide Mirror fit all cars, SUVs and trunks.